We’re kicking off a whole month of “Homeschool Planning” posts for you here on Only Passionate Curiosity! Last year, I ran a Planning 101 series, which was hugely popular. It seems that many people get overwhelmed at the task of scheduling out their curriculum and lessons in a way that works for them. You really don’t need to be overwhelmed (really!). Planning isn’t that bad, especially if you have the right tools for the job. This year, I am doing my planning in a Erin Condren Teacher’s planner, a big, beautiful book, designed for classroom teachers, but easily adaptable to be the perfect planner for my homeschool. What do you need to plan? The easiest way for me to share this planner with you is going to be to go through it section by section. I’ll tell you what’s there, and how I am using it for homeschool purposes. Even though this planner was made for the classroom, I’ve found a way to use every section to it’s fullest potential. Get a 10 dollar off Erin Condren coupon by signing up here. The first pages inside the planner include a place for your personal information (in case you leave it at co-op! ), room to write down websites and passwords (for that yearly subscription I’m always forgetting about), and two pages for classroom teachers with information about classroom volunteers, room for field trips (which I will use), and a helpful information for substitute teachers (which I plan on covering with more field trip slots). 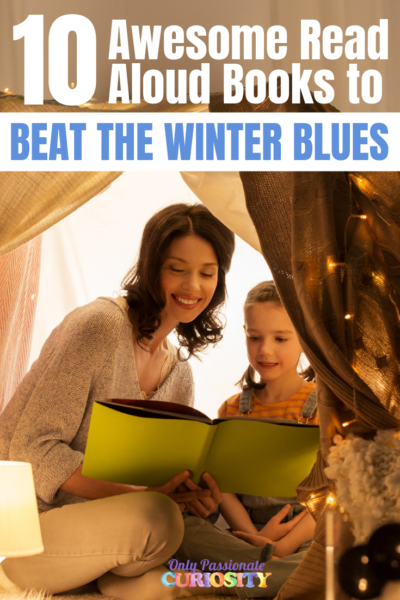 This section includes a monthly list of holidays- including some lesser known ones like Fire Prevention Week, Laura Ingalls Wilder’s birthday, and more. I loved the education related extra holidays, because this year, I hope to use them for some smaller unit studies and celebrations to up our fun factor. There is also a page to note birthdays and special events for your family. This tab is the one you really won’t need as a homeschooler, and I re-purposed it completely. 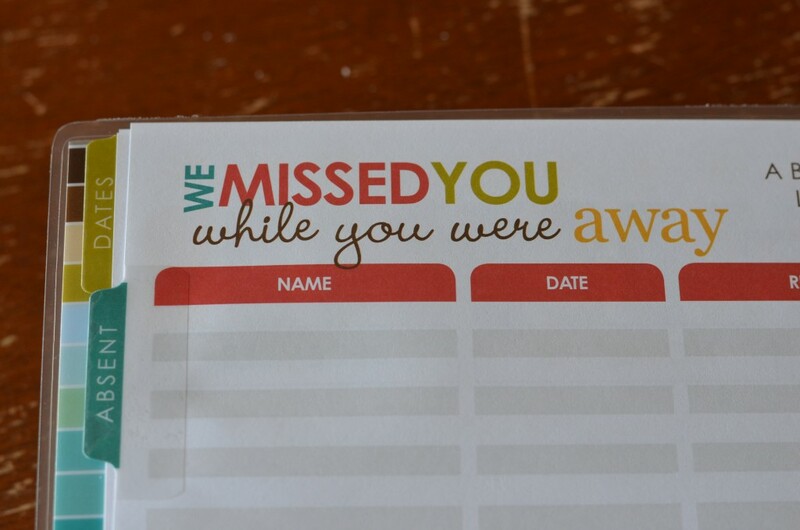 It’s a “while you were away” spread sheet where a classroom teacher would note who was absent, why, and if they brought a note. I converted this to our homeschool reading list, where I can keep track of what books the kids are reading. The columns now read “name” “date” “author” and “note” (which is a check box). I am writing down the title of the book, the date they started the book, the author of the book, and checking the note column when the book is completed. 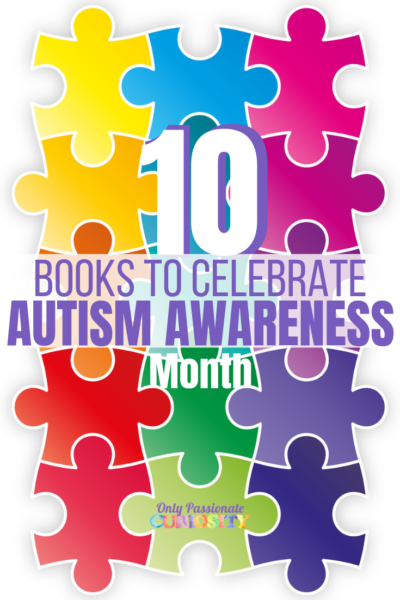 There are 6 pages, which should be enough for all of our reading for the year! This section is graph paper, and I am using it currently to plan the layout of our new homeschool room. It can be used for all sorts of things in a homeschool, grades, lists, ANYTHING really that you need graph paper for. This big, blank spread for the year which is intended for class birthdays. I am using this page for our full year, at a glance, big picture planning. 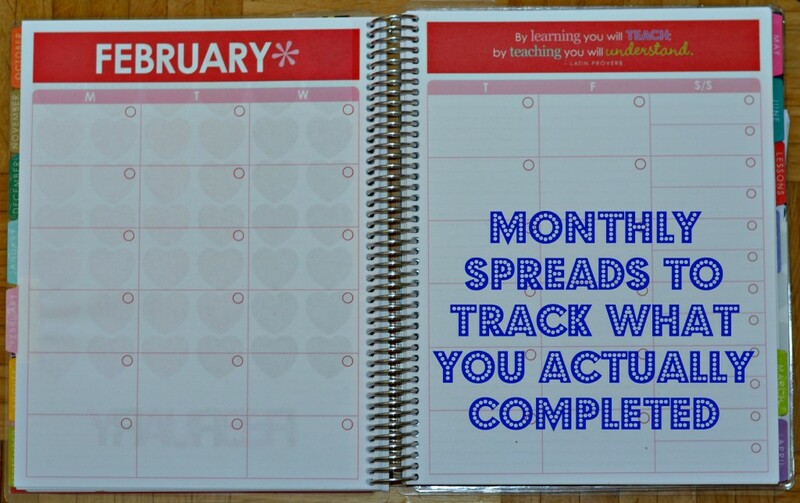 Last year, I shared all about how we make this big yearly plan, as a way for me to see visually when we really need to buckle down for school, and plan what days I want to have off. This makes it easy for me to break down how many days I have to teach, how many days we have for breaks, and when those breaks are going to be. This year, I am planning on working 6 weeks on, and one week off, year around, with a bit of a break over December and January for the new baby. These two sections are what makes this planner gold for me. Remember last year when I told you I have two separate planners for my homeschool? On one hand, I make a yearly master plan, where I break down our curriculum into daily lessons with an ideal in mind. It’s a master pacing guide that helps me see what I need to get done, and when in order to pull off our school year. I know how many days of school I need for each subject, and it’s all planned out as an ideal before we start on that spread sheet. Then, as we go throughout the year, I write down what was actually completed in the planner itself, and cross things off the master schedule sheet as I complete them. This way, the planner is a complete record of what we have accomplished, and the schedule sheet helps me see where we are ahead, where we are behind, and what I need to do to catch up. Sometimes, I just scratch things off the master planner (if they are redundant, or if I was just over eager on our yearly plan) but the actual planner stays nice and clean and doesn’t overwhelm me (because I am the boss after all). It’s like Erin Condren read my mind here. There are two distinct sections of this planner, which are perfect for planning as I do. The Lesson Planning pages are not dated, rather they are numbered by week and day. There is room to break down 6 subjects over 40 weeks. This is the section where I put my “ideal” master plan. Then, there is a monthly spread. In these boxes, I only write down what was actually completed. This is going to be fabulous for the reviews we will have to do next year, and it helps me feel accomplished to write down what we actually did, rather than just look at what I ideally wanted to get done. It’s a small space, but I came up with a little code for what we accomplished (basically, I use the acronyms you see on forums, things like OM for Oak Meadow, or TT for Teaching Textbooks) and it’s easy enough to see at a glance what we have completed. The final section is a checklist spreadsheet. Typically, a school teacher would use this to track assignments and grades for her students. It doesn’t really work that way in a homeschool, but this list does lend really well to daily to-do’s. On the name column, I listed the date (just numbered 1-31 each month) and on the colored lines, I added in things we needed to do every day. Things like “laundry” “dishes” “work out” “read aloud” and so on. This section is for me as the parent- I do well with checklists to help me stay on track and feel accomplished at the end of the day. 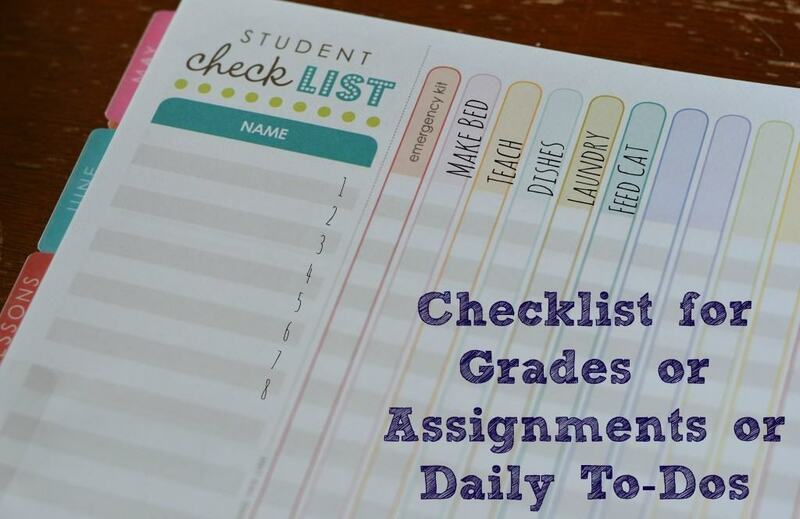 I took to my facebook page to ask what other people would use this section for- some suggested reading checklists (to keep track of 15 minute increments, or what have you), kids chore charts, hygiene charts for kids- basically anything you would use a checklist for, these pages will work for. There are also two pages of blank stickers for you to write your own topics on. There is also a folder page to stick loose papers, a zippered pouch to hold anything you like, and a page protector sheet (where I stuck our state legal policy). One of the things that drew me to the Erin Condren planners in the first place is the bright colors and quality of the print jobs. I don’t know about you, but I love pretty office supplies, and gosh I deserve nice things too! This planner just makes me cheerful. Every last page has bright, cheerful colors. The cover is bright and happy (and, customizable). It’s just pretty and that matters to me. The construction is sturdy, and the reenforced pages are standing up to use (granted, I haven’t had it long- but seriously, this thing is a solid brick…. it’s not going to fall apart on me). I love the stickers that came with it (I added my own extra too! )- I can just pop them in for reminders about reviews, appointments, or field trips, and the bright colors call attention to those occasional events at a glance. I do wish they had a homeschool version (maybe some day!) instead of me needing to adapt sections, but honestly, no planner has ever been everything I could have ever dreamed of. I don’t mind the few adaptions I needed to make, but if Erin Condren ever decides to make a homeschool version, I hope they call me, because I have ideas! For the modifications I made, I used a white out marker and Washi tape. I didn’t remove anything from my book, I just re-purposed the small amount of existing pages noted above. A couple people have mentioned the price (59.00 regularly) being a bit steep for a planner during the time I have had it. For me, this purchase this comes down to the planner being just about perfect for my needs, being bright and happy, and I don’t have to print it myself! After years of printing my own planners (and always splurging on color) I was thrilled to not have to spend the money on ink and paper (for a planner this size, it would easily use up ALL my ink, and a ton of paper, laminate, and then I’d have to pay to bind it), and mine would have never turned out this nice in the end. I am happy with the investment, and plan on purchasing it again next year (yes, on my own dime). I feel like this planner is going to be HUGE for me this year, not only to keep me on track, but also to help support me in my record keeping. We are moving to Maryland, where the reporting requirements (in my opinion) are quite intimidating (twice yearly portfolio reviews???? You’ve got to be kidding me…) and I plan on using the book lists, record of accomplishments and plans as an easy way to frame our portfolios. I can just look in our planner to decide what I want to pull out and include in the planner, and I’ll be good to go. Get a 10 dollar off coupon by signing up here. 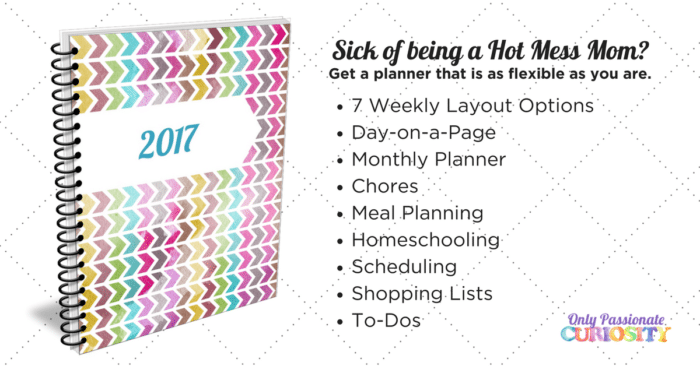 I was curious to know how you have enjoyed using this planner for your homeschool. When you have the chance, I would love to see a follow-up post on how it has or hasn’t worked for you. I know you wrote what your plans were for each section and how you might adapt them for homeschooling, but I was curious if you could show some photos of how it actually turned out. Thanks! I wish I did have pictures! I love this planner, and had such good intentions for my year, but between the international move, difficult pregnancy, and even worse recovery, I didn’t get to use the curriculum I had planned for the year for very long. We ended up moving to survival school mode, and the kids went mostly to workbooks and online programs to tide me over as I nursed myself back to health. So- this planner as shown here still looks the same- with the lessons planned in the lesson section. I did record the reading, and videos we watched also, but I just didn’t get to use it as fully as I had planned. I *just* placed an order for another one for next year so I can actually use it this time (knock on wood!) now that I am feeling better and am ready to get back to the way I like to do school with the kids. Wow! I am so thankful you reviewed this and showed us how you use it! I am especially excited that there are two sections for lesson planning BECAUSE I TOO noticed that there was what I wrote down and planned…and then there was what really happened. I am seriously considering this now. Do you think you can do a walk through so we can see the pages and how you set them up? LOL! I thought that’s what I did! When I do, hopefully it will be the kind of detail you were hoping to see here. This will be my first year homeschooling. I have been working on it for months! Not yet. We are just getting into homeschooling with my preschool aged son so I guess I feel like I can be a bit more flexible than if he were older. I’m just getting started with my planning. well, i need to plan my academic year nowadays ! I student-taught this last semester, and I’m beginning by teaching career in the 2nd grade in the public school system. I’m thrilled! 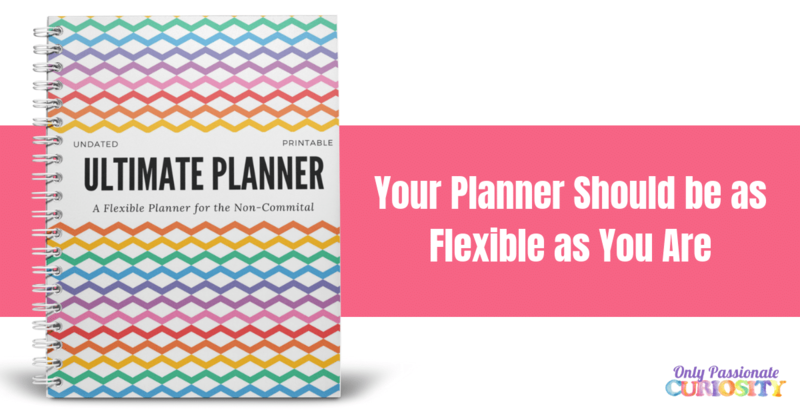 I was introduced to Erin Condren and her line of planners while student teaching and fell immediately in love with the organization and trendy fashion. I have a planner purchased at an office supply store and it’s always open and on my desk to keep myself organized. I am a mom, a teacher, and an independent representative, so I have to know which way to go and when at all times. My sister is a homeschool teacher, and we swap ideas continuously! Congrats on the new position, Angela! I had such a ball with my (classroom of one LOL) 2nd grader, I can imagine how wonderful a whole classroom of that age will be. So eager to learn, but still very sweet and young. Best of luck! Good luck with the Masters program, C.P. I hope you have a wonderful year teaching! This is an awesome planner. I can’t ever seem to find one that has everything I really need and this one seems to have it all! I’m just starting to plan and I’d love one of these planners! Not yet – just moved to new state/house and need to get unpacked first! Feeling slightly anxious about not having everything planned out yet! We are just starting to plan out our homeschooling year. 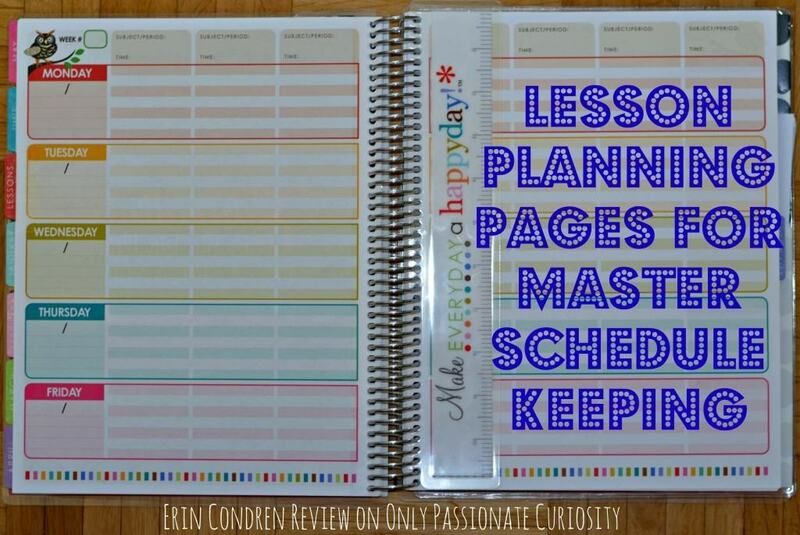 Luckily, I just ordered myself an Erin Condren Life Planner….but am going to have to relook at the school planner. I wasn’t sure how I was going to utilize that one…but now I know! 🙂 Thanks!!! This is my first year fully planning out our homeschool and keeping records as my daughter will hit compulsory schooling age on Saturday. My daughter starts first grade this year and I honestly have no idea how I’m going to plan it. I do have a teacher planner from Erin Condren and I love seeing the way you use it. It’s given me plenty to chew on. I am right in the middle of our planning. I have books, need to schedule. The planner would be perfect. I am terrible at planning and would love to have this! I love your review and how you use it as a home school teacher. I have high hopes for this planner. I hope to improve organizational skills this year. I always have so much going on and the basic planner we get at the start of the year is nice but this one is so much better. It’s everything I need in one book. Thanks for hosting this giveaway and thanks Erin Condren and team for this sweet treat. no but an EC would help! I haven’t written anything in an actual planner yet, but I have given it a great deal of thought especially with our most recent circumstances which will change everything. I need to be more of a planner this year. Thank you for the opportunity to win this planner! Thank you for the review! 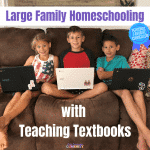 I am new to homeschool and was trying to figure out what to use for the planning everything out. This is my first year homeschooling 3 kids. I’ve selected the curriculum, but still need to plan the schedule. This is my first year homeschooling and working with a friend to start planning out my daughters 1st grade work. I have not planned my year yet, but we’re not done with the current year and we don’t start next school year until September, so we have some time 🙂 I’m excited to get started on planning, though, especially after seeing this planner! Its fantastic!!! I just barely started planning. This is my first year homeschooling and I haven’t even thought of planning till I saw this blog post! I haven’t started planning yet because we have been on vacation. But I am planning to work on it later this week. This will be our first year of home education, so I best get planning soon!! I don’t plan too far ahead. I use one curriculum and order the upcoming grade at the end of the school year. I haven’t started planning yet since I’ve only been out of school for 1 week! Would love to win a planner! I haven’t started planning as yet and would love this new planner! It is so bright and inspiring! I haven’t started yet. Still recovering from this past year. I didn’t plan my new year yet because we are still in this year. We have to make up some work then I will plan for the new year. Great giveaway. I love their planners and the stuff for the students. If I had the money I would buy everything in the website. I have NOT planned my year…I’m looking for inspiration to keep going. 😉 And I tend to plan LOOSELY for the year and then more MONTHLY. Thanks for the contest! I’m an EC ADDICT! After 13 years of homeschooling you’d think I have this planning thing down. . .I have started my ‘list of things to think about. . .” LOL. Great review! I want to start homeschooling and I’m going to need all the pretty accessories I can get for motivation. I have started planning but I have quite a long way to go. I’m the world’s worst planner. I start back to school in less than two weeks and I haven’t even decided on all the curriculum for next year. Eek! I have most of my year planned, for my preK daughter. I don’t know if I’m happy with it or not haha! Great post! I would love to have something like that. I am in planning process and actually ordered the erin condren teaching planner yesterday! A day before i read your review! So glad to see that it will be useful for homeschoolers too! 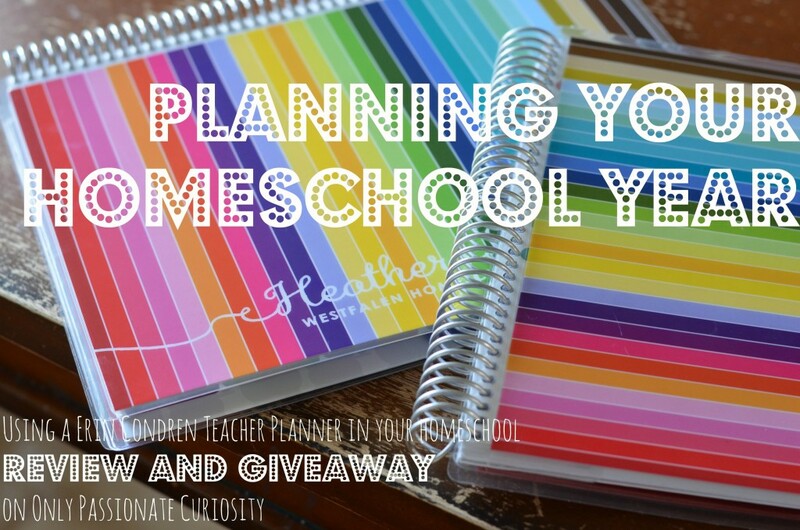 I have started planning our next homeschool year but I have a lot yet to do. I think this gal needs to branch into the homeschooling niche! Very cute. I do love the pretty colors of this planner! I usually use a cheap one from Target which is nothing more than a calendar. Nothing exciting here! What a great review! I was wondering how the teacher planner would work for a homeschooling family. I already have my school planner for the Fall, but will definitely check into this for the next year. Great review on the EC Teacher Planner. I am awaiting a Life Planner, but was very curious about the Teacher Planner for homeschooling as well. Food for thought! I have chosen curriculum. This is our second year homeschooling and I am just starting to think about year planning instead of weekly. I am beginning the planning process right now. I am working on the master plans for each course at the moment and have been drooling over the EC teacher planners. Thanks for such a great explanation of how we homeschoolers can make it work for us. I school year round so I am always planning….as I finish one book I order the next and roll right into it. Because we finish different subjects at different times I am always planning. I could really use something like this to help. Haha NO! Haven’t planned the year yet – need to start! 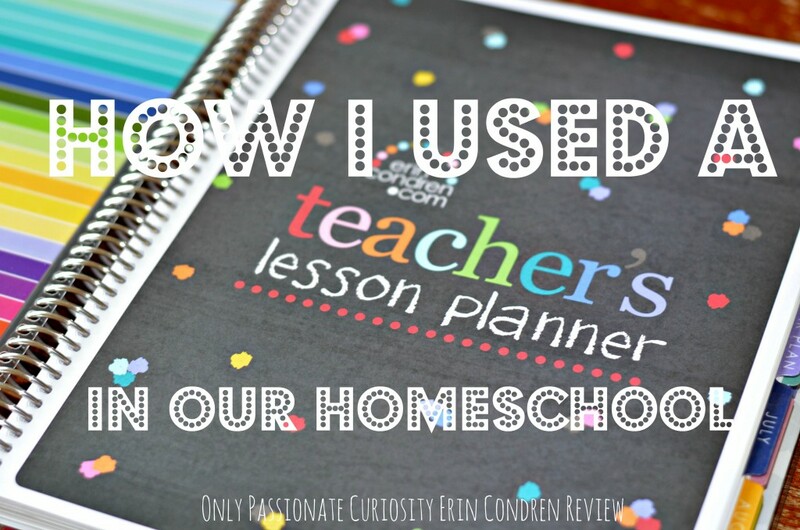 When I first got my EC planner I wondered how well the teacher planner would work for my homeschool. Now I can’t wait. Great giveaway! I love your insight and ideas on ways to use the teacher planner. Love it! Thanks so much for sharing– we really appreciate your support! We’ll pin to our Pinterest ‘review’ board… http://www.pinterest.com/erincondren enjoy! I desperately need to start planning. Soon and very soon! We school from January to Thanksgiving so we are in the middle of our year still . No! LOL I plan a week at a time. I have an idea of what needs to be covered in the year. We just “do the next thing” as we go along.